Hezbollah first became known to the Lebanese public in 1985 with its now-famous open letter, whose introductory statement read: "We are the sons of the umma (Muslim community)—of the party of God (Hezbollah), the vanguard of which was made victorious by God in Iran. … We obey the orders of one leader… that of our tutor and faqih [i.e., Ayatollah Khomeini]." A year later Hassan Nasrallah, then an officer associated with the party's consultative council and now its supreme leader, made the organization's overall goals and strategy unmistakably clear: "We are incapable at the present time of installing the rule of Islam, but this does not mean postponing our ideology and project … We must work hard to achieve our goal, and the most important means of doing so is to transform Lebanon into a society of war." Hezbollah's strategy for converting Lebanon into an Islamic state depends on the marginalization of the country's Sunni population. 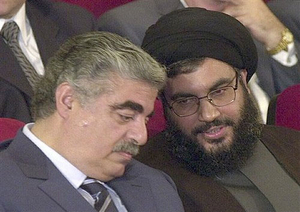 When the popularity of Western-oriented Sunni business tycoon Rafiq Hariri (left) soared nationwide, Hezbollah was forced to act. Hariri was incinerated in a car bomb in 2004 in an assassination that has been directly tied to Hezbollah operatives. He is seen here with Hezbollah's Hassan Nasrallah, May 25, 2001. It has been argued that Hezbollah's 2009 manifesto, which revised the open letter, underscored the organization's diminishing revolutionary zeal and growing acceptance of Lebanon's permanence. Yet a careful reading of the manifesto shows it to be merely playing with words, recognizing Lebanon as "our homeland" but not as a legitimate nation state. Indeed, far from being in a "continuous process of identity construction," Hezbollah has striven during the past few years to overcome its limitations and promote its ultimate goal of transforming Lebanon into an Islamic state modeled after Iran's wilayat al-faqih (the guardianship of the jurist). Hezbollah needed physical space to spread its propagandizing mission and to carve out a constituency in the hearts of Lebanon's Shiites. Even before the party's official formation, proto-Hezbollah militants clashed with the police in the southern suburbs of Beirut. They seized on President Amin Gemayel's (1982-88) attempt to clamp down on Muslim militias and restore state authority as evidence of his hostility to Muslims in general (and Shiites in particular) and transformed themselves from an innocuous movement committed to religious guidance and education into a full-fledged politico-military party. It was not particularly difficult for Hezbollah to undermine the role of the state in Shiite areas like Beirut's southern suburbs and the Bekaa Valley. Shiite quarters were poverty-stricken, and in northern Bekaa, the birthplace of Hezbollah, the state was virtually nonexistent. Thanks to generous Iranian contributions, Hezbollah took it upon itself to provide its impoverished constituency with basic services, such as water and sanitation, usually provided by a state. It successfully traded services for loyalty and proceeded to its next objective of becoming the sole Shiite hegemon. Efforts to organize the Lebanese Shiites into a political movement of their own began to take shape in 1974 when Imam Musa Sadr, an Iranian cleric of Lebanese origin, ushered in political Shiism and founded the Movement of the Dispossessed. The movement soon built up a militia and, a year later, acquired a new name, the Amal (Hope) movement. Sadr's success in rallying coreligionists behind him had much to do with his determination to place the impoverished Shiites on Lebanon's political map and bring an end to the condescending treatment they received from other sects, as well as the Sunni preference for keeping them powerless. From its beginnings, the Amal movement opted to play by the rules of Lebanese confessional politics—provided the Shiites were no longer overshadowed by Sunnis—and was prepared to this extent to collaborate with the Maronite establishment. Yet the rise of the Palestine Liberation Organization (PLO) in Lebanon after its 1970 eviction from Jordan interfered with Sadr's plans to transform Shiites into a major actor in Lebanese politics. The imam disliked the presence of armed Palestinians in southern Lebanon but carefully avoided clashing with the PLO since it was politically incorrect for Muslim politicians to deny the organization's right to fight Israel. At the same time, Sadr forged an excellent working relationship with the Syrian regime of Hafez al-Assad. Sadr's mysterious disappearance in Libya in 1978 and the success of Ayatollah Khomeini's revolution in Iran less than a year later had a dramatic effect on Lebanon's Shiites. Thanks to the size of the Shiite community and the country's joint border with Israel, Lebanon featured prominently in Khomeini's efforts to export his Islamic revolution. Nabih Berri, who took charge of Amal in 1980, explicitly positioned it against the Palestinians and tried to challenge them militarily. His ideological laxity and political utilitarianism eventually eroded the movement and "plagued it with moral degradation." Since Amal did not present itself as a sufficiently credible ally, it became incumbent upon Khomeini to create a new politico-military group for his purposes. Tehran at the time wanted to respond to the Gulf Cooperation Council's (GCC) support for Baghdad in its war against Iran by creating an ideological base of support within an Arab country. As time went on, its local agency in Lebanon had grown strong enough to establish for itself a niche in the Shiite community. It soon targeted the Shiite Left and eliminated its prominent activists and ideologues, such as Hassan Bazzuni, a member of the central committee of the Political Action Organization, the communist thinker Hussein Mrouei, and academician Hassan Hamdan (aka Mahdi Amel), through assassination. After decimating the Shiite Left, Hezbollah turned its attention to fighting the Israel Defense Forces (IDF) and its local surrogate, the Southern Lebanese Army (SLA), before taking on Amal and driving it out of Beirut's southern suburbs, a task completed by 1988. A year later, Hezbollah resumed its offensive against Amal in those parts of southern Lebanon outside the control of the IDF and the SLA. The Iranians and Syrians intervened to normalize relations between the two Shiite forces and established a new balance of power that recognized Hezbollah's preeminence. Upon Israel's unilateral withdrawal from southern Lebanon in May 2000, Hezbollah shifted its main emphasis to consolidating its grip on the Lebanese political system and completing the construction of its own ideal society. The outcome of this process was the creation of a distinct Hezbollah community that looked to Iran for inspiration and directives. In tandem with its effort to gain control of Lebanese Shiites, Hezbollah moved to monopolize the fight against Israel, which had begun in 1982 as the objective of the largely secular National Resistance Front (NRF). Those religious groups that had merged to create Hezbollah in 1985 did not initially participate in the low-grade anti-Israel guerrilla warfare that was at first led by Lebanese communists, members of the Syrian Social Nationalist Party, and remnants of the Democratic Popular Front for the Liberation of Palestine. But by 1987, Hezbollah had taken control of the access routes to the Israeli-established security belt in southern Lebanon, which effectively rendered the NRF useless and led to its disbanding. Hezbollah also introduced its own military wing, the Islamic Resistance. It banned any group from launching independent operations and stipulated that all fight under its flag and name. Hezbollah soon introduced its own reductionist definition for patriotism; terms such as "the liberation of Shib'a Farms and Kfar Shuba Hills," "Hezbollah's deterrent military capability," and the "sanctity of the triumphant resistance" became nonnegotiable precepts of the Lebanese political parlance. Questioning the legitimacy of Hezbollah's military wing and its arsenal became synonymous with "conspiracy against the resistance, collusion with Zionism and U.S. imperialism." In Lebanon's confessional politics, it is a must for any political group representing a major sect to affiliate with a counterpart from another major sect in order to navigate the turbulence of the political system. Shortly after the conclusion of the 1989 Ta'if agreement, which ended the decades-long Lebanese civil war, Hezbollah came to realize it needed to "to portray itself as a principal promoter of Muslim-Christian coexistence … through multi-confessional representation." Unable to identify with the Lebanese Force or the Phalange, whose ardent nationalistic ideologies clashed with its universalistic Shiite aspirations, Hezbollah eventually found a partner in the Christian former Lebanese Army commander, Michel Aoun, who was said to nurse a grudge against fellow Maronite politicians for denying him the presidency in 1988. After fifteen years of exile in France, he returned to Lebanon in 2005 and took up the reins of the Free Patriotic Movement (FPM) which he had led in absentia. In accordance with the logic of Lebanon's confessional politics, FPM and Hezbollah needed each other, and, in 2006, they signed a memorandum of understanding that enabled them to pursue their distinct interests under the guise of unity. Before turning against the Sunni political and security establishments, Hezbollah needed to eliminate independent-minded and outspoken Sunni clerics because of their ability to frame religious identity through politics. This context helps to explain the 1982 assassination of the director of the Union of Islamic Associations and Institutions in Lebanon, Sheikh Ahmad Assaf; the head of the Supreme Islamic Shari'a Council, Sheikh Subhi as-Salih, in 1986, and the grand Sunni Sheikh Hassan Khalid in 1989. Assaf possessed strong organizational capabilities and displayed a powerful sense of communal identity whereas Salih had challenged the Twelver Shiite imamate and the wilayat al-faqih concepts, both of which under-girded Hezbollah's ideology. Sheikh Khalid's crime was to attempt to convince the GCC countries to lead a new Arab deterrent force to free Lebanon from the Syrian stranglehold. This was completely unacceptable to Hezbollah whose prospects of achieving success hinged on excluding GCC influence and relying on Damascus. The 1989 Ta'if agreement ensured that pro-Syrian Shiites and Maronites would control the country's political, security, and judicial apparatus. But the return to Lebanon of Sunni business tycoon Rafiq Hariri from Saudi Arabia shortly thereafter upset the political balance that Hezbollah had sought in its favor. In 1992, a majority of parliamentary deputies designated Hariri their favorite candidate for the office of prime minister. His meteoric rise to power threatened Hezbollah's efforts to dominate the Lebanese political scene, especially since he received the unconditional backing of Saudi Arabia and the West. Hezbollah concluded that Hariri represented a threat to be eliminated, a view shared by Tehran and its Syrian henchman, Hafez's son Bashar al-Assad. Hariri's influence was unacceptable and contradicted the pattern of fading Sunni power in the region, and thus he was assassinated in 2005. In June 2011, the U.N. Special Tribunal for Lebanon (STL) indicted four Lebanese suspects linked to Hezbollah in connection with the assassination. Hezbollah leader Nasrallah has categorically refused to turn them in because "the STL is an American-Israeli tribunal, and the four indictees are our brothers in resistance who have an honorable record." The Hariri assassination brought to an end his project of reconstructing postwar Lebanon along political and economic lines that favored Saudi Arabia and the West. Thus, a formidable hurdle was removed from the path of Hezbollah's designs for Lebanon. Saad Hariri, Rafiq's son and political heir, lacked the acumen and foresight to continue his late father's policies, let alone keep Hezbollah in check. The key to Hezbollah's getting away with the assassination required dismantling Hariri's private intelligence outfit, the information section of Lebanon's Internal Security Forces (ISF). Hariri wanted to take advantage of the tradition that enabled Sunnis to lead the ISF and to attach an intelligence component to it to counter control of the Deuxieme Bureau (military intelligence) by Shiites and their Maronite allies. Instead, Hezbollah began a new reign of terror. In 2006, Samer Shihada, an investigator into the Hariri assassination, was the victim of an attack that killed four of his security guards and convinced him to emigrate from Lebanon. In 2008, Wisam Eid, a captain in the information section of the ISF, was murdered in an explosion linked to his investigation of the mobile communications used by the hit team that assassinated Hariri. Eid's innovative investigative techniques had alarmed Hezbollah officials, who told him "that some of the phones he was chasing were being used by Hezbollah agents conducting a counterespionage operation against Israel's Mossad spy agency and that he needed to back off." In 2012, a major explosion in east Beirut killed the chief of the information section, Wisam Hassan, only a few hours after his return to Lebanon from a foreign trip. The identity of Hassan's assassins has not been established, but the fact that Hezbollah completely controls security in Beirut's international airport casts suspicion as to who might have committed the act. Hassan's elimination from the scene ended once and for all the security challenge that the information section had presented to Hezbollah. Hezbollah also used proxies to embroil its Sunni opponents in debilitating scandals. For this, the group prefers to use pawns such as Fayez Shukr, secretary general of the Lebanese Baath Party, and Wi'am Wahhab, chief of the minuscule at-Tawhid Druze party, and especially the pages of al-Akhbar, Iran's mouthpiece newspaper in Lebanon. During the 2006 summer war between Israel and Hezbollah, al-Akhbar made its debut, coinciding with Hezbollah's charge that Saad Hariri's Future Trend (FT) party and Saudi Arabia were colluding with the U.S. and Israeli governments to destroy the group. In 2010, the newspaper fabricated charges against Tariq al-Rab'a, head of the administrative planning department for mobile phone operator Alfa, thereby playing a decisive role in his arrest by military intelligence on suspicion of communicating with the Mossad and giving the Israelis access to the Lebanese mobile network. The arrest of Rab'a, a Sunni from Beirut's Tariq al-Jadida neighborhood, bastion of Hariri's political support, occurred with the help of partisans of Hezbollah's Maronite ally Aoun, who have taken charge of the Ministry of Telecommunications and Alfa Mobile and framed a case against Rab'a. More recently, al-Akhbar has sought to implicate Hariri's Future Trend in the arming of the Free Syrian Army (FSA) fighting Bashar al-Assad. It featured on its front page the transcript of an alleged conversation between a member of Hariri's parliamentary bloc and a representative of the FSA requesting arms. While the FT may actually be acting as a liaison between the FSA and arms providers, the newspaper simultaneously ignored Hezbollah's role in fighting alongside the Assad regime's forces. As a totalitarian political party, Hezbollah cannot survive without a military component and will not accept anything less than full control of the Lebanese political system. The problem of Hezbollah, which possesses the premier military force in Lebanon, is its inherent incapability to transform itself into a genuine domestic political force in fear that "its legitimacy [would] become equal to ordinary political groups that accept the rules of accommodation." This in turn means that Hezbollah has not abandoned its goal of creating an Islamic state of Lebanon. Hezbollah has indeed gone a long way to achieving its objective of controlling Lebanon since its humble 1985 beginnings. It dominates the country's domestic and foreign policy and operates a military machine superior to the national army. It has the final say on making governmental, administrative, and judicial appointments, and its interaction with Lebanese political groups has shown that it has no intention of truly assimilating into Lebanese political practices, not least since its Islamist Shiite orientation precludes its ability for a meaningful dialogue (as opposed to tactical alliances) with the Sunnis. Moreover, the Iranian paradigm of wilayat al-faqih, to which Hezbollah subscribes, baffles many critical-minded Shiites. Not surprisingly, Ahmad al-Asaad, leader of the fledgling Shiite party, the Lebanese New Option Gathering, believes that "we must get rid of Hezbollah in order to build a viable state." The winds of change are transforming the Middle East and are bound to leave their mark on the course of events in Lebanon. Syria's uprising is unlikely to bring democracy to the war-torn country, but it will almost certainly alter the existing balance of power in Lebanon. The specter of a Sunni resurgence in Syria is already haunting Hezbollah in Lebanon. "An Open Letter, The Hezbollah Program," as-Safir (Beirut), Feb. 16, 1985. Joseph Alagha, Hizbullah's Identity Construction (Amsterdam: Amsterdam University Press, 2011), p. 33. "Hezbollah Manifesto," Moqawama.org, Islamic Resistance in Lebanon, Nov. 30, 2009. Alagha, Hizbullah's Identity Construction, p. 22. As-Siyasa (Kuwait City), Aug. 1, 2011. Akif Haydar, al-Ashia Biasma'iha: Min Ajl Lubnan Afdal (Beirut: Sharikat al-Matbu'at li-l-Nashr wa-l-Tawzi, 1995), p. 51. Khalil Ahmad Khalil, Naqd at-Tadlil al-Aqli: Shi'iat Lubnan wa-l-Alam al-Arabi (Beirut: al-Mu'assasa al-Arabiyya li-l-Dirasat wa-l-Nashr, 2001), p. 59. Haydar, al-Ashia Biasma'iha, p. 66. Waddah Sharara, Dawlat Hezbollah: Lubnan Mujtama'an Islamiyyan (Beirut: Dar an-Nahar, 1997), pp. 160-220. Hilal Khashan and Ibrahim Mousawi, "Hizbullah's Jihad Concept," Journal of Religion and Society, vol. 9, 2007, pp. 25-6. Nadia Aylabuni, "Niqat Muthira fi an-Niqash hawla Hezbollah," in Ahmad Abu Matar, ed., Hezbollah: al-Wajh al-Akhar (Amman: Dar al-Karmil, 2008), p. 58. Sheikh Muhammad Yazbek, Ayatollah Khamene'i's representative in Lebanon, sermon, accessed Dec. 28, 2012. Alagha, Hizbullah's Identity Construction, p. 41. Muhammad Surur Zayn al-Abidin, Ightial al-Hariri wa Tada'iyatih ala Ahl as-Sunna fi Lubnan (London: Dar al-Jabiya, 2007), p. 22. Al-Manar TV (Beirut), July 2, 2011. Naharnet News Website (Beirut), Nov. 23, 2010. Al-Akhbar (Beirut), Dec. 13, 2010. Turki al-Hamad and Maza Yurid al-Sayyid, "Hassan Nasrallah wa Hezbollah?" in Ahmad Abu Matar, ed., Hezbollah: al-Wajh al-Akhar (Amman: Dar al-Karmil, 2008), p. 52. Steven Simon and Jonathan Stevenson, "Disarming Hezbollah," Foreign Affairs, Jan. 11, 2010; "Hezbollah Dominates Lebanese Government," The Jewish Policy Center, Washington, D.C., June 15, 2011; "Hezbollah," The New York Times, Aug. 15, 2012. "Hezbollah," The New York Times, Aug. 15, 2012. See Adel Hashemi Najafabadi, "Imamate and Leadership: The Case of the Shi'a Fundamentalist in Modern Iran," Canadian Social Science, no. 6, 2010, pp. 192-205; Ahmad al-Katib, at-Tashayu as-Siyasi wa-t-Tashayu al-Dini (Beirut: Mu'asasat al-Intishar al-'Arabi, 2009), p. 118. Related Topics: Lebanon | Hilal Khashan | Spring 2013 MEQ receive the latest by email: subscribe to the free mef mailing list This text may be reposted or forwarded so long as it is presented as an integral whole with complete and accurate information provided about its author, date, place of publication, and original URL.